I downloaded a couple of apps recently from the Thai apps store and still got the sense that things could be -- and needed to be -- a lot better as far as Thai-based developers are concerned. Within the world market there are a lot of good apps available, as well as a large body of those that are not really worth the time of downloading. If the description looks reasonable, I try things out (especially if they are free), but I have paid for a few that I have later regretted. Fortunately, the cost has only been a few baht in most cases and for the time being I retain 100 or more apps. I have reviewed several apps both in the Bangkok Post, Database, eXtensions column and in the Bangkok Diary. There is no point repeating myself, so I have links to these at the end of this commentary. In summary what I found in those early apps was a great potential with some weaknesses. Wit the apps developed in Thailand, there was a considerable weakness which I hoped resulted from the novelty of the medium and the platform. I am yet to be fully convinced, so after another couple of disappointments set out to analyse apps that have been developed in and for users in Thailand. I want to start with apps from True, the current designated carrier for the iPhone in Thailand. They took a bit of a gamble with the device as 3G has not been properly implemented in the Land of Smiles, mainly due to dragging of the feet in government-related telecomms organisations and committees -- the old men that have always been the biggest drag on development here: youth gets things going, age stops it dead. Before the arrival of the iPhone officially in Thailand, the App Store opened and True was one of the first of the local developers with apps available. I was disappointed that most could not be used on the first generation iPod touch I own, but sooner or later, with the way that all technology has inbuilt obsolescence, that will not matter. True have a number of developers and I know that one or two attended the last Apple Worldwide Developers' Conference in San Francisco. Although I did not get to meet them while we were there, it was nonetheless encouraging to know that they were there. Many Thai companies would ignore such an event and try to get on with things themselves. True's motivation for the iPhone, for its ADSL, its TV business and the True telephone system (earlier in conjunction with Orange) is money. I do not find that unacceptable under normal circumstances, despite my liberal leanings, and understand that really, in the words of the song, Money Makes the World go Round (Cabaret). A number of their apps are aimed at financial services or online sales, but it is with songs that I start. Their True Music app was a bit unstable to begin with and I could never make it stay active for more than a second or so, particularly if no network connection was available. That improved with an update and this app links to online videos of singers and groups popular here. It is not available for the generation 1 iPod touch. There are three sections at the top of the main panel: New Releases, Top Hit, and Recommended. Each displays a selection of mini-panels showing various artists. These are mainly Thai, although not exclusively so. One of the artistes I noticed was Lady Ga-Ga, a US performer who is quite well known in Thailand and it was possible to view an online music video of her. When we select a specific artist's tune, pressing the panel will start display a video panel and this is in landscape mode. The interface looks like YouTube but has no indication of this. The quality of some of the videos I saw was pretty poor with contours and some blockiness visible as well as a general lack of sharpness. At the right of each tune panel is a blue arrow and this links to an information page: all in Thai, with one or two English words mixed in. There are three buttons here: View, which shows the video; Favourites, adds the video to the user's own list; and a greyed out Download button. The last was not active in any of the videos I examined and I am unable to say at this stage if this is because the service is not active. I am using a DTAC SIM card usually although I did also try with a True SIM card and in both cases (and all videos I checked) that button was greyed out. This app goes some of the way towards what I think we should be supplied in Thailand, although it falls a little short in some of the execution. True now has some 32 apps on the app store and I have already looked at one or two like the wifi app and the Thai Dictionary. Another app is the Easy WiFi app that, with the way accounts and logins work in Thailand, would be useful if one were using the True WIFI system round the city: it enables a user to enter details one time and subsequent logins are free. They do have a free app called Thailand Guide but this is in Thai only. The same app for English users is a disgraceful $9.99. Anyone looking for online guides can find plenty before resorting to such a blatant exercise in racism: the two-tier pricing that so many here have to suffer. I am sure a lot of work went into this (without seeing it I cannot comment on the quality of any English), but here is the sort of app that should be used to promote not to penalise. Several of the apps that True offers are, however, free. 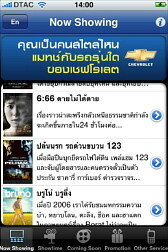 An example is the TNN 24 that offers news in Thai and English. The Nation already has such an app and this works fairly well with a list of items similar to its news-feeds accessible via Safari. Another media app is the True AF6 app that is for those masochists that are fans of the Academy Fantasia show running forever on Thai TV which has people of dubious talent and personality reaching for the stars: or at least the fame. As many Thai stars are merely famous for being famous, this is not in the same league as the US American Idol. True also has some other apps that are of a nature that makes them less attractive to me, such as the free Lotto app, and the Tarot app: free in Thai, $1.99 for the English version. True Money is part of an online payments service: a user buys the card then uses the credit to pay for services: just the sort of thing that works well on the iPhone platform. While the free True QuickCall seems a little redundant in providing a quick link to names in the Address Book. Accessing the Address Book itself is quick enough and the favourites section of the iPhone would seem to provide fast enough access to a number as well. Another waste for me would be the TrueVisions app which lists TV programs on the cable and satellite channels True owns. As these are listed in their own pamphlet, and on the web as well as the newspaper and all are liable to arbitrary and instant unannounced changes there would seem little point to this. It does not work on the first generation iPod touch like so many of their apps. True does have some good apps although many are shallow and not well thought out: as if a rush to market -- to get as many online as possible -- was the main criterion. They are absolutely right in linking some of their other available services via the iPhone apps, but all to often either the service itself is not well run, or the app has a sloppiness that ought to be revised out. We had mentioned in one of those earlier articles the efforts of Derrick Gooch who did a good job of mixing the internet and the iPhone with hotel booking in Thailand; while his Bangkok Sky Train was a little basic, his Thai language Daily News newspaper app was useful. For getting around Bangkok, I preferred the free BKK Transit, while the Thai language iTraffic, which displays traffic conditions at selected intersections in Bangkok, cries out for an English version. I was not entirely happy however, with the way this linked to Google Maps. I did a search for Post Office and came up with some half a dozen possibilities: like Starbucks I know that there are more. One of the so called Post Offices was a link to a place called "Be My Guest" a bed and breakfast establishment that purports to be in Din Daeng. The link did not work on the iPhone but it displays a really nice page on the Mac which I guess works mainly on Adobe Flash: shame that. But quite how Google Maps has this under Post Office, I don't know. The accuracy of the maps and images is also in doubt concerning the age. 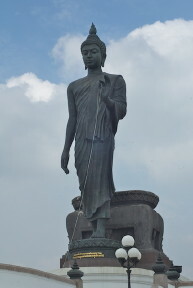 Where I live -- we always look at home -- off Phutthamonthon Sai 3, to the west of the city, is a good example. I have lived in the house for some 15 years, but according to both map and the satellite photo, there is no road linking the next three sois; and I assure you it is there. 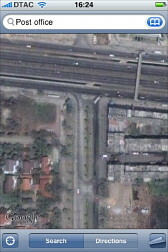 What is also there in Sai 3 is a bridge that crosses the highway and was finished some 4 years ago. But if you relied on Google Maps, you would not see that bridge and might go for a long round trip to get back to the city. The map shows that there is a dual lane which was built about 10 years ago, so with the proximity to my house, we clearly have two sets of maps and images being used: all considerably out of date. I was reminded of that map when I downloaded an app, called iMapsPro. Indeed, I have a fascination with maps which perhaps comes from the days when I used to ride my BMW K100RS all over the central area of Thailand and beyond. It helps to know where you are. iMapsPro had all the makings of a useful bit of software for its $0.99, but lets the user down with a thump in use. It sounds grand enough, and displays a lovely colour map of the City of Angels with the ring road clearly recognisable. On initial start-up it asks if it can use location services, which is encouraging, but when I pressed the locate button I had a notice telling me that my location was not supported as I was outside the bounds of the map. That was true, although I still live within Bangkok. Actually looking at the map is not much better, unless you want the central area and the first few sois of Sukhumvit. I could find Chinatown marked, and the Grand Palace. 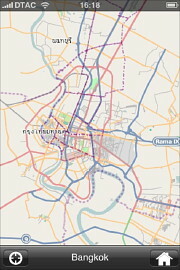 However, when you cross the river by the Bangkok Bridge, the other side -- sort of round Wongwian Lek and Wongwian Yai -- doesn't have any streets marked at all, although the BTS (minus its new stations) extends as far as Petchkasem Road -- a major highway -- which is also not named. I would hope that this would have some form of update. And soon. I wrote a review for the App Store. There are loads of these iMapPro apps for scores of cities round the world, and they include Phuket and Chiang Mai too. I expect they are downloading the data from somewhere and pasting it into a template. The data needs improvement. Brighthouse labs are doing this, one suspects this is intended for tourists rather than locals, but a map is a map and there are certain parts south of the river, like that train to Samut Sakhon, that is attractive to tourists as well. 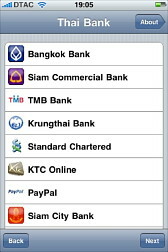 I was initially encouraged by an app I found called Thai Bank at $0.99. Having downloaded the app for access to online banking here, I decided to register for a couple of the services. I use both the Bangkok Bank and Siam Commercial but both need registration first, and the former requires a personal visit, while I had problems with the SCB online registration. Among the extensive list of banks and services listed is PayPal and I do have an account there so tried this out. The log-in screen is simply a full size web page and some of the information a user might want to view needs the screen to be scrolled across. Once log-in is complete, this full size makes things worse as the data an account holder wants to see is spread right over the page and when viewing one part, the other is not visible. Unlike the version of Safari on the iPhone it was not possible for me to view the page in landscape mode which might have made things a little more tolerable. And usable. Com.Thai-g.com have a few apps now and I first came across this developer with the basic (free) Thai Pray: a Thai language app for the display of a selection of Buddhist sermons. I had already covered this in the Bangkok Post. This has a limited audience, both in terms of language and content, but did make a good starting point. It took on board one of the basic lessons of all software development: do one thing, but do it well. The "well" part of my analysis is perhaps a bit subjective, but the basic display, the clear text and the content focus would seem to fit those criteria. They also offer one of the more expensive apps at $28.99 (986 baht), with the title UL (Universal Life) that is aimed at insurance agents who need to calculate premiums and other actuarial data. As this is a Thai language app only, the audience for this is extremely limited. I did not download this because of need, cost and language, so cannot offer any comment as to its value or otherwise. The English description on the App Store pages suggests that those examining life insurance policies could use this as if the agent were beside them, so the developer may be hoping that non-insurance people would also download this. If so, the price is against it. This developer has what appears to me to be a bit of a mixed bag and I wonder if they have a plan, or just work on apps they are asked to develop. From the spiritual to the actuarial we move to entertainment and an iPhone app that is called Major Movie and this (with a couple of minor reservations) is what we should be expecting from developers here. Major Cineplex is a cinema chain that has several locations, particularly in the Capital, and they do tend to show the more popular movies as they come round. 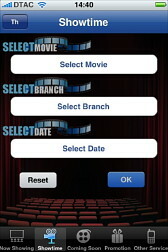 The app opens with a display of what is showing now in the cinemas. There are four other icons at the base of the screen: Showtime, Coming Soon, Promotion and Other Service. At the top of the screen is a panel with the title of the screen (e.g. Now Showing), an information button taking us to a screen with app information and a TH/ENG button that switches the display information -- the main section of the screen -- between the two languages. On my first try out, I was quite happy with how fast this changed, although I was using my home network which I am also happy with. Showtime is an interactive panel. The user selects a movie, the cinema, and the date. I wrongly thought this was disappointing until I figured out just how correct it was. We must remember to select the language before entering the search, but once that is done, the movies are shown using that selector wheel that appears in so many apps. When the location was then selected, there appeared to be some inconsistency with where the movie would be available. What the app actually does is to select exactly where the movie is being shown and when I checked with the newspaper listings, Bruno, for example, was only being shown in the Paragon Complex. A movie like G.I. Joe was listed as at almost every Major cinema: the locations being in English/Thai. What was a shortcoming was that this only applied to the current date. In the selector for this item, only one day was shown, so it would be impossible to plan for the coming weekend for example. In a panel similar to Now Showing, Coming Soon listed some 19 of the movies expected to arrive in Major's houses. Tapping the movie's section or the blue arrow revealed a panel with a more complete synopsis. The three Thai movies shown had no information in English. There was Thai. Some other minor detail was shown for each (PG 13 etc.) but no arrival date. 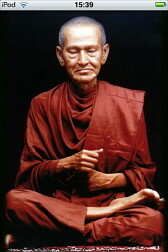 The Promotion panel was limited to Thai information only. Us Westerners need to have friends who can read about the Kit-Kat 60 baht offer or that the True movie lovers promotion applies to all True customers. The final panel, Other Services, links to some useful telephone numbers that can be dialled directly from the panel. This app is (sadly) not intended for the iPod touch and will not install on that device. There are one or two limits concerning the date and some of the editorial content but the only problem with the app itself will be a user's access to the internet if wifi is used. As I wrote above, the app is what should be happening here and shows that some of the developers are beginning to learn their craft.